Yeah! My first pdf pattern of 2010 (definitely not my first pattern of 2010 though, I did finish writing my book just a couple months ago!). Meet Zeke the Aloof Alpaca! So there you go, pdf pattern #17. Zeke is the perfect use of a ball of lovely Alpaca yarn you have sitting around, since I am sure you are like me and have a lovely ball of Alpaca yarn sitting around somewhere. Even if it is sitting around in your Local Yarn Shop and you just have to go pick it up! He's up on Ravelry and Etsy, so go there now! He's adorable! I am sure you mentioned it somewhere in your blog but I'm too lazy to look it up- when is your book due out? He's super cute! Good job on the new pattern! And.. since I'm newish around here can you tell us more about the book?! So cute. Do you know the llama song? My kids sing it to me, something like "here's a llama, there's a llama, and another little llama, funny llama, fuzzy llama, llama, llama, duck". He is just adorable, well done Rebecca! He is fab! 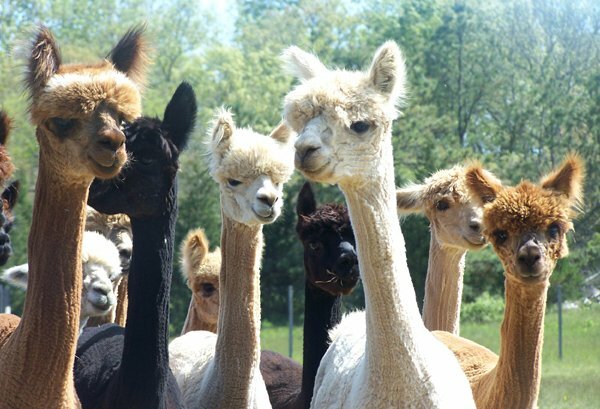 I love Alpacas too, and I agree they are really expressive creatures. Ridiculously cute! Now if only I were a better knitter! I'll be linking this in my weekly roundup on Saturday. Have a great day! Thanks guys! I really appreciate all the great comments recently. It is a book of 20 ALL NEW monster patterns published through Martingale & Co.
No, I ain't known for my patience, either! No, I've never heard the llama song, what tune is it to? He is wonderful! Love him to bits!